A very fine sheet depicting Paul Verlaine (1844-1896) at the Broussais Hospital in Paris, where he died in January 1896. For the last ten years of his life, Verlaine spent long stays in various hospitals, totalizing more than four years. He suffered from a very painful arthritis in the knees (hence the walking stick on which he is leaning) aggravated by his chronic alcoholism. But another reason was that he was homeless after his mother’s death and suffered from a recurrent lack of money, in spite of his literary fame (he had been elected «Prince des poètes» in 1894). Hospitals offered him free boarding as well as a de facto abstention from alcohol. In Mes Hôpitaux in 1892 Verlaine let many notes describing the structures of the hospitals, touchingly acknowledging how the doctors were kind with him, and the calm atmosphere of the wards where he could read and write peacefully. Graverol was part of the Symbolist milieu in Paris, as well as in Brussels, and knew many writers of the movement. La Plume dedicated an obituary issue to the poet in February. Another version of the present watercolor, entitled «Entre le Lys et la Rose» was published in this issue. Indeed, Graverol realized five different versions and studies – recorded today – of this drawing. Our version is more linear than the one illustrated in Dennis Cate, Toulouse-Lautrec and La Vie Moderne (2013, p. 300). The composition is underlined with delicate lines in black ink offering a more legible and sharp image. Evoking medieval manuscript illumination, it is also related to Art Nouveau illustrations; the importance given to vegetal motifs, the arabesques surrounding the composition and the women silhouettes remind us of Mucha. The two women, on both borders, could represent the Muses of Poetry and Music, or express the antagonism between old and young, night and day, life and death. Above, an angel and the face of an old woman seem to welcome the poet in the after-life: the angel opening his arm to the poet in heaven, while the allegory of Death, serious and sad, illustrates the fatality of Verlaine’s demise. 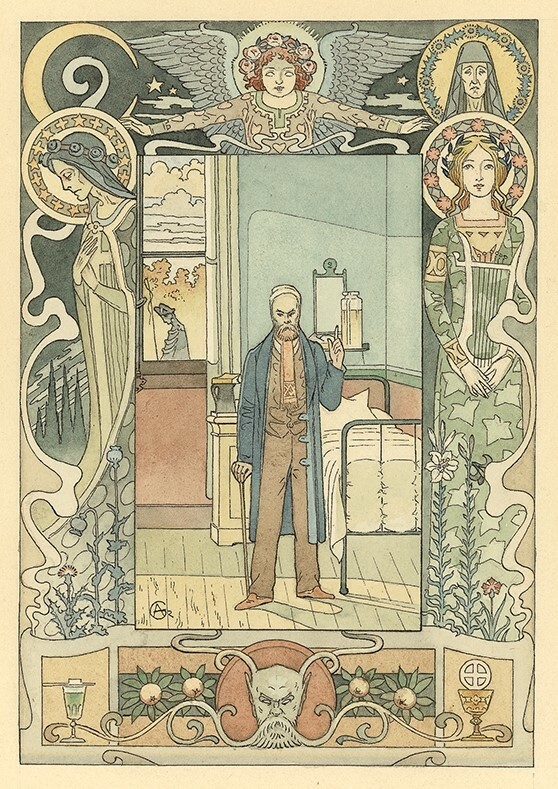 At the bottom, the face of the evil – with some of Verlaine’s features – incarnates Verlaine’s ambivalent behavior: on the left, a glass of absinth and apples, symbols of sins, on the right, roses and the holy host and chalice, symbols of redemption. Notwithstanding that Verlaine endured a desolated life, his texts and books had an important success, and he was supported by many officials. Two different plants are encircling the poet: the thistle, symbol of the human suffering and the lily, symbol of the innocence recovered after death. Graverol transformed Verlaine into a Christianized figure who has suffered, and will raise again through the art. His left finger is pointing to the sky, as a premonition of his death and the path he has chosen. Our drawing captures this reality: while a coachman of hearse with his whip is waiting outside, the poet in his simple room is already turned towards his after-life and his consecration. Another portrait of Verlaine in the Broussais Hospital was made in 1891 by the painter Aman Jean and is kept at the Museum of Metz, birthplace of Verlaine.